Ten years ago, in meantime, vocalist Hesgaroth and instrumentalist Denosdrakkh (respectively the lyricist and song composer too) started this outfit, Lutece, after they disbanded Dark Requiem. They wrote and recorded some first material, and in 2007 they released the debut album …And Ancestors Still Remain. After an EP one year later (Awaking Ancient Gods), everything got quiet -Lutece was supposed to be a temporary outlet for both members involved-, but the band returned in 2013 with …Our Ashes Blown Away. And now the quintet (besides Hesgaroth and Denosdrakkh, the band consists of Ask on bass (he did not co-operate on this album), guitar player Hod Imensül, and drummer Kraftum) releases its third full length studio recordings. 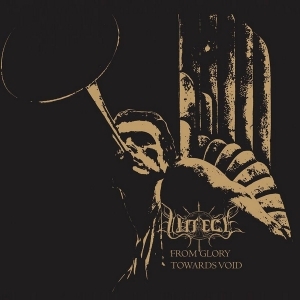 From Glory Towards Void lasts for just over fifty minutes and was mixed and mastered in Germany with Lasse Lammert (think: Huldre, Svartsot, Alestorm amongst others). Lutece deliver quite an intense and overpowering full-force-ahead type of high-tech and melodic Black Metal, which withholds a timeless and universal approach. The multiple string lines (melodies, riffs & rhythms, basses included) are the basement of quite a powerful experience, strengthened by truly majestic drum patterns and excellent screams and grunts. Hammering, warlike rhythms interact quite subtly with intriguing tremolo riffs, strengthened by the technical escapades (mind the grandiose balance in between classic, somewhat nineties-oriented constructions and modernistic injections). There is no progressive experimentation going on, but don’t focus on the Second Wave trend either, because From Glory Towards Void trespasses certain pathetically narrow-minded limits. I am referring, in this case, to elements like the monstrous production, the organic but well-balanced interaction in between the different speeds (and believe me: the tempo really balances in between slow-doomed and blasting, and everything in between), or that fine-tuned equilibrium of harsher outbursts and well-prepared war-marches. For there is not that much renewing, I won’t go to deeply into the concept this time. I’d like to conclude with my appreciation for this band’s high-crafted song writing and execution, and especially the magnificent sound quality. From Glory Towards Void is a great recording, despite lacking originality, but I am truly impressed by the result. Fans of no-nonsense, intensive Black Metal be warned!